So I’ve been here just over 2 months now, eating rice and noodles every day, breathing in its polluted air, and not being able to order anything on a menu without the aid of pictures. I’ve climbed the Great Wall, visited Harbin, went swimming in the world’s biggest building, and saw the Terracotta Warriors, to name but a few. These 2 months have been a roller-coaster… literally! I have learned so much about China, from its history and its language, to the people and their life-styles; it’s been fascinating learning about such a unique country. I implore, go and visit China. It’s one of those countries where you will go ‘wow’; in a good and bad way. The Chinese people themselves are something you will be amazed by. Their generosity, kindness and gentle nature sets them apart. Bad though, in that their (only what you would see in horror films) toilets will leave you horrified and thinking we have walked back into the stone-age. The wafting scent of the toilets will hit you before you’ll actually see them, and the bins that greet you when you go to the ‘WC’ are really terrible. There are good points though, in that the Chinese have some great food. As I’m living in Sichuan, everything is hot and spicy which I LOVE. Their speciality dish is Hot Pot, where you can choose what food you can boil in a simmering metal pot. This is very common in Chengdu and I personally love it. The bad side is when more unusual things crop up, from chicken feet (they love this) rabbit heads to Yak blood. Although I’ve been here for a little while, I still miss home! I have to remind myself that I’m in the real world now; with a full day of work and my weekends off. We try and do something productive with our weekends off because they are like gold-dust, they magically appear, and then disappear; facing another week of lesson planning and early mornings. The previous weekend, myself and Charlotte decided to hit Chengdu city for some ‘window shopping’ and just to get out and about. We got a bus to the subway station called ‘Chengdu Institute of Public Administration’ where we took half an hour to reach Chanxi road, the main shopping area of the city. Although we are 1 hour out of the city altogether, it’s not too bad, it could be a lot worse! The subway is great, really clean, efficient and easy to use; we would be lost without it. We spent the day shopping, went all Chinese and got a Pizza Hut, then headed home at about 8pm. On Friday night, we ventured to Longquanyi town, 10 minutes by taxi from our college. Again, we went all Chinese, and went to a French restaurant! We’re not lazy! Firstly, it’s so hard to actually order something to Chinese, we don’t have a notion what the food actually is, or whether it would be nice, and so we went safe and went to a fancy French restaurant instead. We really need to learn more Chinese. . . It was good to actually get out of the college for once! This weekend gone, we decided to go mad altogether, and went OUT… yes we actually went out for once! We met a couple of friends from the course in Chengdu city, checked into our hotel, and headed out for the night! The last time I was out was when we first arrived in Chengdu. It was a good night! “Will I need my umbrella?…Nah it will be grand sure” how wrong was I.. It bucketed down the next day, so we all ended up soaked to the bones. That’ll teach me. So this week is back to teaching, and lesson planning. Although I don’t mind, it does come rather monotonous. Wake up, teach, office, bed. Wake up, teach, office, bed. I enjoy talking to the students though, just general conversations about China. I love learning about China because it’s so different to home. I love learning about the people, their customs, and the language. I try and talk to them about Ireland and the comparisons between the two countries. I’ve dabbled a little about Chinese politics and history, mainly about Taiwan and Japan, so I’m intrigued to find out what the students think about this. From my questions, they think Taiwan is DEFINITLY part of China, and that the majority of Chinese people don’t like Japanese people. I’ve also discussed the relationship and rather turbulent history between Ireland and England, so I think they understand more about the differences there and how it relates to China and Japan. Interesting stuff! I’ve also set up a QQ account. Honestly I’m being plagued with students. ‘Are you on QQ?’…’Will you accept me on QQ?’ ’I wrote to you but no response’… ‘Did you read my message on QQ? I don’t mind talking to them at all, its’ just that once I’m on, that’s it, they will all be messaging me ‘HELLO TEACHER, HOW ARE YOU?’ That’s not what you want when your lesson planning. So when I’m free I go on it and message them. I still have no idea how it works anyway but it’s somewhat like MSN Messenger, Skype, Hotmail and Facebook rolled into one. You can send emails, chat and even video on it. So tomorrow (Tuesday) and Wednesday are my busy days. I have 8, 45 minute lessons. 8!! I’m counting down the days when I never have to do them again…. Only 12 more Tuesday’s and Wednesday’s to go! 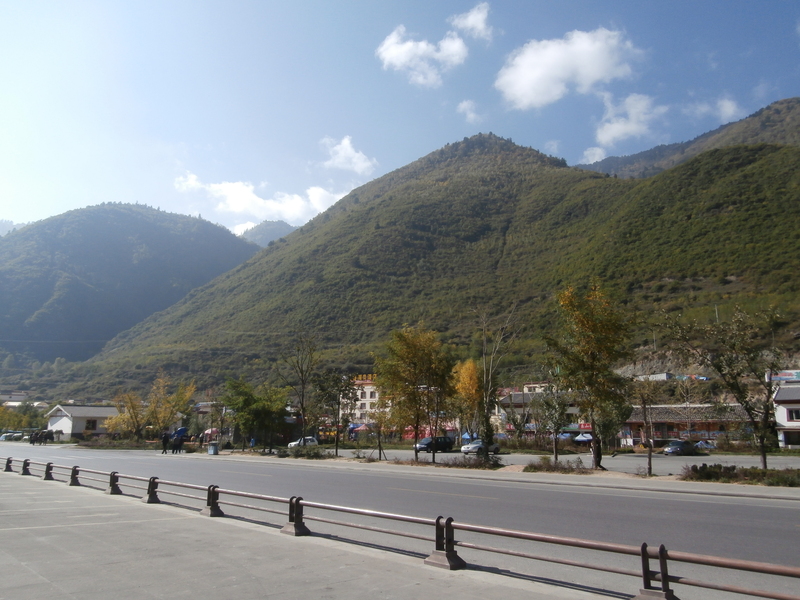 Juizaighou: the village was surrounded by mountains. Us trekking up the mountains on horses! Such beautiful scenery! 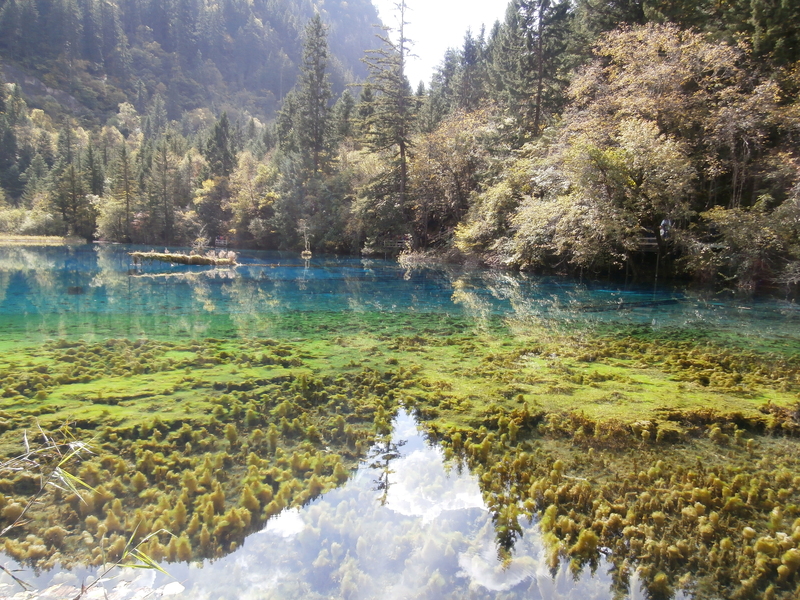 Juizaighou Park: the water was very clear! It was a lovely area to walk in, I would highly recommend it! I hope to post more pictures up; I only found out how to post them correctly. The Chinese: a great bunch of lads. ‘Look at them there, aren’t they great? The Chinese: a great bunch of lads.’ I got that quote from an Irish sitcom called Father Ted. It this episode, Ted, an Irish priest living on a remote island, has unfortunately made himself out to be racist against Chinese. In his bid to rectify this, he makes a presentation about the Chinese about how great they are, including pictures of the Great Wall, which Ted says ”So big you can see it from anywhere in the world”, Mr Miyagi from the Karate Kid film (he’s in fact Japanese) and Ming the Merciless from Flash Gordon (he’s actually criticised for being a bad stereotype about Chinese people). It is such a funny series and that particular episode was great. They are willing to help. For instance, if you asked for directions to a person who didn’t know where it was, they will still point you in any direction. They don’t want to ‘lose face’ by admitting they don’t know where it is. This happened us quite a few times, being told completely different directions by people. However if they do know, they are extremely willing to help and guide you in the right directions. They would literally walk you to the area if they could! They are shy. Some of my students are quite shy and it’s difficult sometimes to get them to participate in class. Yet once I make the first move and say hello, they are so excited and they literally beam! They are gradually getting less shy, because apparently in schools, if they make a mistake, they ‘lose face’ and other students will laugh at them. I have to keep reminding them that everyone makes mistakes and that everyone is equal. They are open. But sometimes a little too open! Today, I was talking about your appearance, and one of my students decided to talk about me! He said that I am slim and I smell sweet…. I was a little taken aback but this shows how open they are. Although they would say ‘oh teacher you are so beautiful’, they could also easily remark if you were fatter than them and they wouldn’t think that offensive. They are honest. One example I saw was when I was going to the Subway station by bus. The bus was packed with students finished college. A few more people came on the bus at the back, so because they couldn’t get to the front to pay, they give their money to the person beside them and each person helped take the money to the front of the bus. I was looking in amazement, because at home I wouldn’t trust anyone to do that! They would just pocket it. But no, all the students thought nothing of it by moving the money to the front. It was just so natural and nothing more was thought of it. I think it’s those little things that show that the majority of Chinese people are (in my opinion) a lot more trustworthy and honest than people at home. They are reserved. The Chinese people are generally reserved. They don’t like confrontations, they are more introverted and more subdued. They don’t like to be loud, or be in your face. They would stop, look and be silent if a Western walked by them, rather than call to them or ‘wolf whistle’. I personally believe my personality fits In with a Chinese person. My roommate is the complete opposite, being extroverted and loud; the Chinese people are fascinated by her because she is so different! Although they are reserved, they can also say things that at home we would not say to someone. For example, they would say if you had bad skin or if they perceive you to be rich. You just have to let it go over your head! When I went to KFC and got my food, the place was packed and I couldn’t get a seat. There was a counter by the door where a woman was giving out plastic bags. She was putting the food into bags for the people who couldn’t get a seat and they could take them outside. I never saw this before. I thought it was nice to see that they helped the customers who didn’t get a seat by giving them bags to take them outside. Another thing I noticed in KFC is that the staff give customers bags before they went into the building, this is so they could put their wet umbrellas into the plastic bags. I thought that was nice. That was the first time I saw this happen so I’m not sure if it’s a universal, or Chinese thing. The boys are quite stylish. They really do try and look well. Everything is matching and co-ordinated. There is no one wearing old runners, dirty jeans or trousers. They look respectable and fashionable. The girls, on the other-hand, they also wear lovely dresses and they look stylish, but they do wear some short skirts! You will see hardly any girl wearing a long skirt/dress/shorts. They are above and beyond their knees. And all of them have really slim legs, so having to look at them every day makes me hate my legs! The girls also wear shoes with wedges in them. Nearly every girl will have a wedge in their shoes to make them taller. There are plenty of tall Chinese people here, which I’m surprised about. But generally they are about my height. 5ft 3… so they aren’t that small to need wedged shoes. The Chinese people are really lovely people. They will help you however they can, you just have to be aware of their tendency to say something that you might find offensive…and just carry on. Oh China, why do you do this? Why oh WHY did this happen?? We just got word that from next week, our teaching timetable is going to change…. 2 months into the semester. So instead of finishing at 4:55, the school decided to change it to 5:35. Instead of having an hour and a half break (which is more than enough), we have now been given 2 hours. Our classes now run a half hour late. Whats more, between the double class, the students were given 5 minutes to use the bathroom, they have now been given 10 minutes. Apparently one of the reasons for the extra half hour for lunch was because the students asked for it as they didn’t have enough time for lunch. I got 1 hour for lunch….this 2 hour break is mad. This school must be run by the students? So compared to everyone else in the programme, our lunch break isn’t included in our 35 hours working, and we have to work later than everyone else. And I thought our Advisor had something GOOD to say. As I mentioned in my last post, a week’s holiday was approaching. There was worry in case we could not get a return ticket from Juizhaigou. In china, you cannot buy a return ticket on the same day, which is quite bothersome. So we had to deal with the prospect of being stuck in Juizhaigou and missing class the next day. I would get fined if I miss a lecture, they take it that serious in my school! However we were lucky in that we got return tickets which we were delighted about! I warn anyone who is thinking of traveling through China by bus or train, do not even think about it! Majority of my week was taken up by traveling. We had to catch a 13 hour bus to Xi’an from Chengdu. A 15 hour train from Xi’an BACK to Chengdu. After waiting 2 hours in Chengdu, we had to take a 10 hour bus trip to Juizhaigou. Then because of the amount of traffic, we got stuck up Chengdu’s mountains for over two hours, meaning it took 13 hours to get back by bus. I was beyond tired on Monday night. My traveling will be done by plane next time! Apart from the traveling, it was good to get out and experience more of China. Monday: After work, I met my friends and we headed to the bus station. We arrived in Xi’an after 13 hours on a bus. Xi’an is a nice city, with the wall surrounding it being the main feature. It is a big tourist area for Chinese and foreigners, I was surprised that some areas are extremely dirty, for example a lot of litter on the ground. It was disappointing to see. 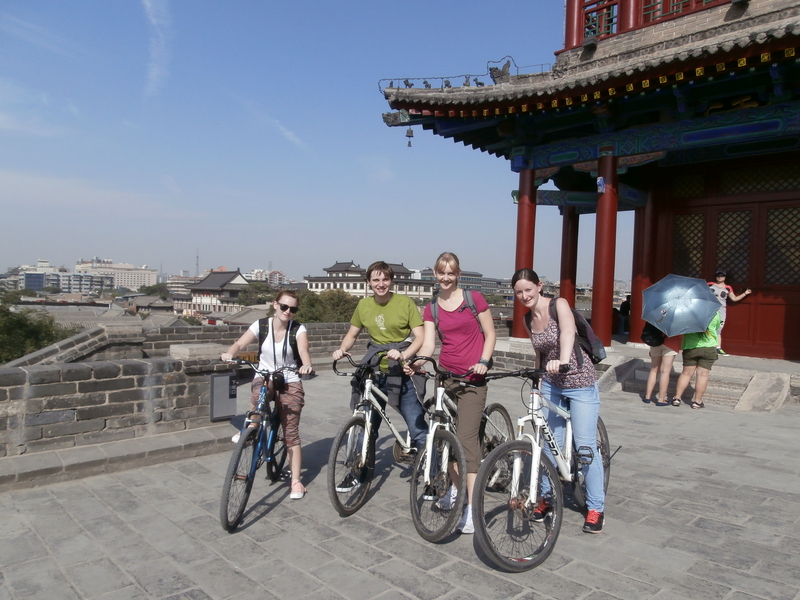 Tuesday: We rented bikes and cycled along the length of the wall. It is in a large square around the centre of the city, so it was great to see the city from the wall. We then decided to treat ourselves and got a Pizza Hut. Wednesday: We went on a package tour where they brought us to see the Terracotta Warriors. The place was packed with Chinese tourists, meaning it was literally impossible to get a good view of the warriors. Although it was great to see, I think the large amount of tourists put a dampener on it. There was pushing and shoving trying to get good photos, so by the end of it I just wanted to get out! I’m sure it would have been a lot better during a normal week. We then went to visit the Pagoda and the water light show, it is really pretty at night around the Pagoda and there is a great atmosphere around the city at night. The water light show was rumoured to start at 8, so with the bad traffic, we risked our lives (literally) and got a Tuk Tuk to get us to the Pagoda. I will never forget that experience! The driver was weaving past people, cars, driving on footpaths, beeping at everyone… it was insane! He did do an amazing job though, getting us their only a few minutes late. Thursday: We went for breakfast and got the train back to Chengdu. Thursday was taken up by traveling. Friday: We arrived back in Chengdu at 5am. I was beyond tired at this stage. I got no sleep on the train as we had hard seats. We got a taxi to the bus station and at 7am, we head to Juizhaigou. As soon as a sat on the bus I was asleep! Now this is rare! That was the first time in years that I actually slept on a moving vehicle! I woke up 2 hours later and we were in the mountains. At around 5pm we were in the National Park, but as always, the traffic stopped because of the amount of tourists there. This meant we had to walk 30 minutes to get to the village. The village is in a lovely location, surrounded by mountains. It reminded me of Switzerland. I have never been to Switzerland, but from television, that’s where it reminded me of. 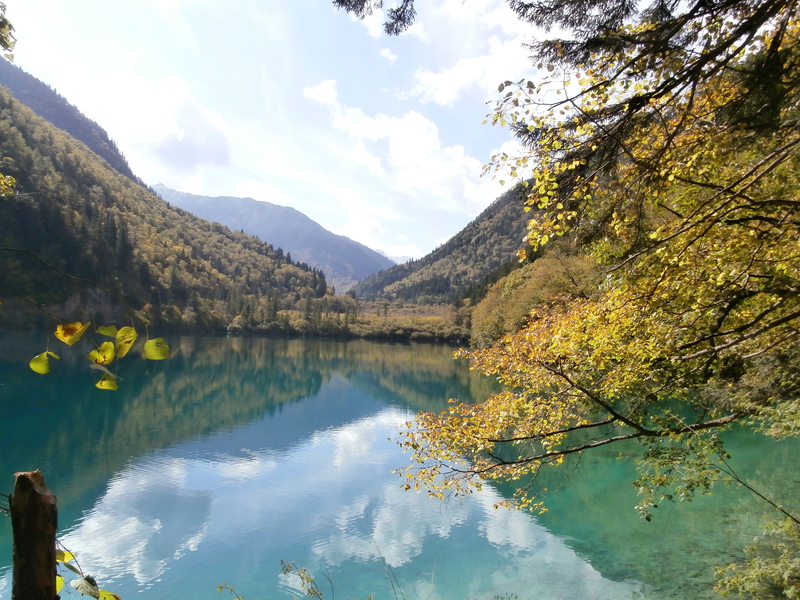 It is situated in the North of Chengdu, and it is heavily influenced by the Tibetan culture. The people who live there also have a distinct Tibetan look about them, and colourful flags with inscriptions on them were all around the village. Saturday; Because of the large amount of people, we could not get tickets for the park. Our plan was to walk in the park for 2 days, so we had to think of something to keep us busy for Saturday. We decided to go on horses and trek up the mountains. The views were gorgeous, where you could see little houses up the mountain and cows in the distance grazing. I really enjoyed it! 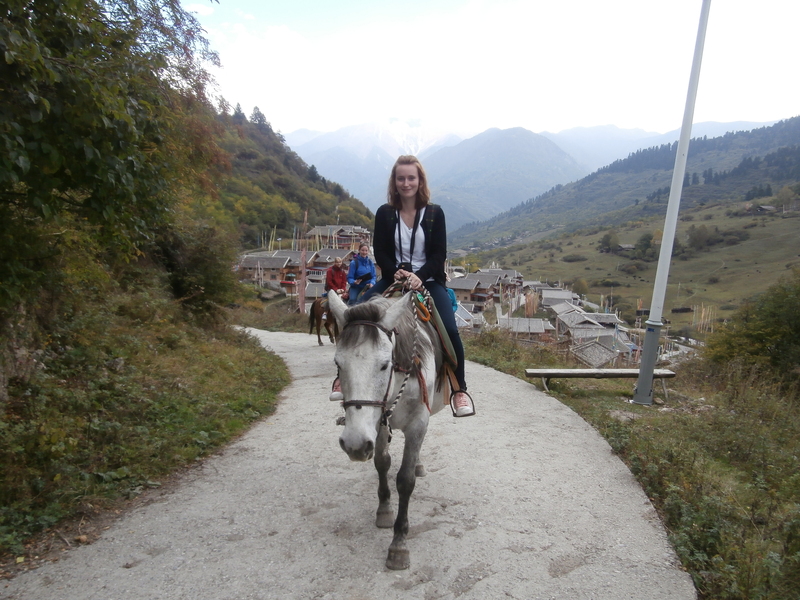 I never would have taught I would trek up mountains on horses in China. After the horses, we got some food and hit the bed early for the next day. 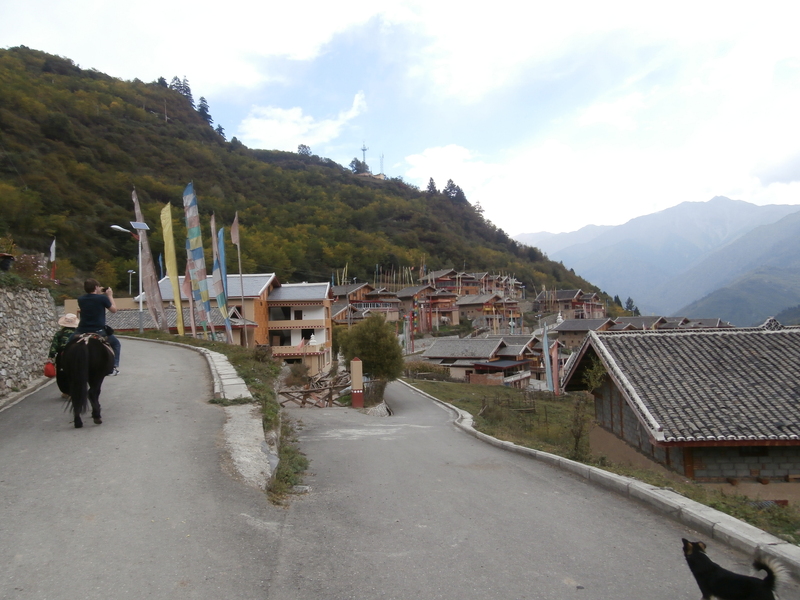 Sunday: We got up at 6am where we got a bus up to the top of the mountain in Juizhaigou. The top of the mountain was freezing! There was ice on the ground so it was extremely slippy. It was that cold that myself and my friend bought huge scarfs to put around us. The park is really nice, with loads of waterfalls and lakes. The lakes are so clear, where you can see right down to the bottom and they are a lovely green/blue colour. I was actually surprised to see that the park was well maintained; there were plenty of rubbish bins around, there was not one bit of litter on the ground, and even the toilets are really nice (I could do a whole blog about Chinese toilets). It seemed that the Chinese people really care about the park. Although the top of the mountain was absolutely freezing, once we got down lower, we noticed how the temperature got hotter. So hot that we had to take our jackets off and scarfs off. The amount of Chinese tourists also crept up, meaning there was a queue to walk around the park at some stages. It took us over 9 hours to finish our portion of the park. There were another 2 travel routes to do! We arrived back to our hostel tired and sweaty, so we got some food and went to bed early. Monday: We woke up at 5:30am to get our bus back at 7am. Yet again, there was traffic, meaning it took an extra 3 hours to get home. I arrived back in the apartment at around 9pm and went straight to bed, looking forward to my 8:30am start in the morning! What I learned: never go to tourist attractions during national holidays, and ALWAYS fly.